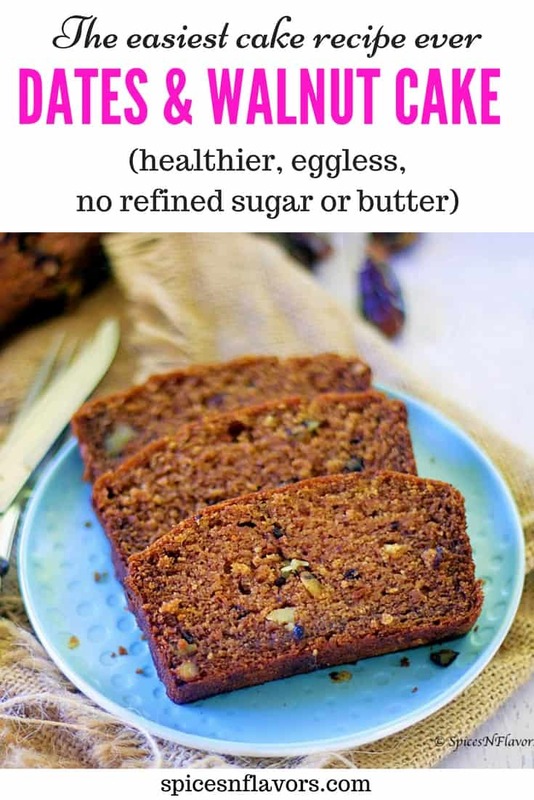 Eggless Dates and Walnut Loaf Cake is a wholesome eggless and healthier cake that is made using Whole Wheat Flour and without adding refined sugar. 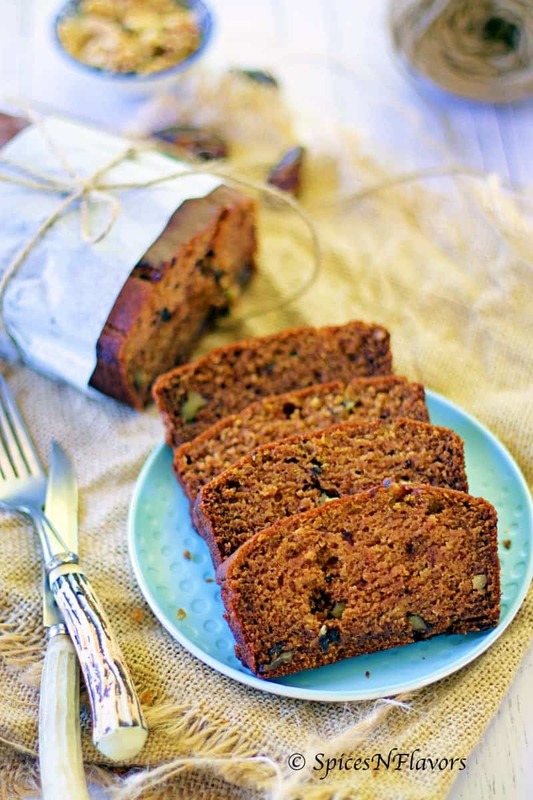 Eggless Dates and Walnut Loaf Cake is what I call a surprise cake!! A. It does not have any added sugar to it, yet perfect sweetened enough for a tea time cake. C. Surprisingly moist cake. all thanks to dates. E. Another element of surprise is that it hardly takes any preparation time. If you exclude the soaking part then it just needs 10 mins of your active mixing time that’s it. Bake and enjoy. So many a time I have made cookies in 15 mins but to bake a soft and moist cake with only 10 mins of prep time (exactly opposite to the Pistachio Loaf Cake that I baked sometime back) is something that I am in awe about even now. If you are anything like me and really enjoy quick simple recipes then definitely check out my Microwave recipes on Youtube. 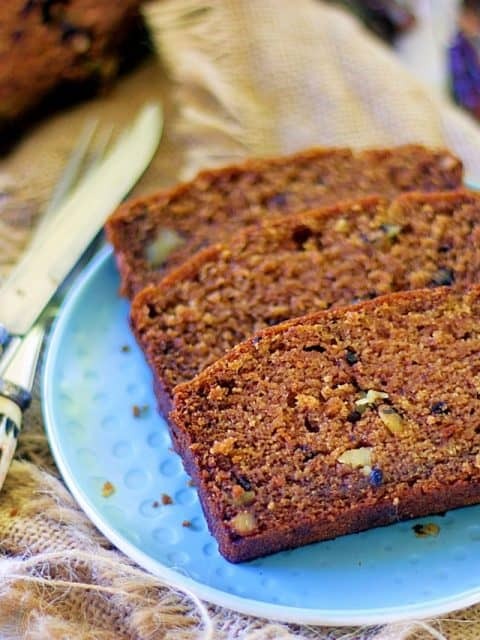 Wondering how do these Eggless Dates and Walnut Loaf Cake tastes? Like I said its a soft and moist cake with soft crumbs. The nuts add a great crunch and texture to the otherwise soft cake. You literally won’t be able to point out that no maida has been used in here. Plus this does not have any added refined sugar and no butter!! Well, wait… is that even a cake then? But yes it is. A must try cake especially if you have kids at home. I hope you will give this simple recipe a try and if you do then share your picture with me by tagging me, tweeting me or even instagram me or best share it on Youtube would love to follow your post. 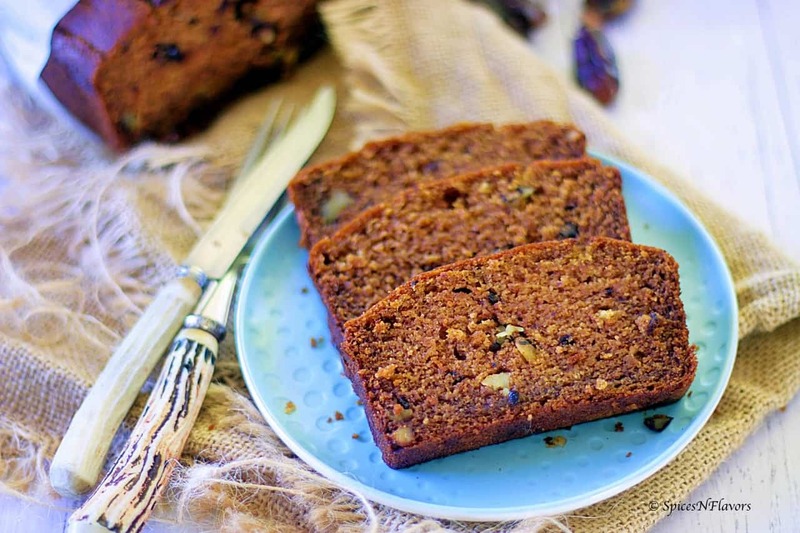 Eggless Dates and Walnut Loaf Cake is a healthier, soft and moist cake that is perfect for your tea time bakes. To this dates milk paste add the oil and mix everything well. Meanwhile, sieve all the dry ingredients. Remove out 1 tbsp of the sieved flour to coat the walnuts so that they do not sink while baking. Add the rest of the flour to the wet ingredients in two batches and mix. Finally, add the walnuts and mix everything well. 1.This easy and simple recipe is adapted from here. 2. Make sure to use pitted dates and also chop your walnuts to bite size pieces. I hope you guys enjoyed today’s post. Hi Ranju.. you can try using equal amount of melted butter here.. since I have not tried it myself won’t be able to guide you on exact measurements.. but oil is what makes the cake moist.. Size of the loaf pan used. Thank you so much Ashwini..
Hi. I tried.this whole wheat dates cake recipe of yours and it was superb. Was.liked by me all those who ate this. Thank you so much. Next try is your ghee cake. What is the size of the loaf pan that needs to be used? Tried this recipe.It was awesome.If I have to double the recipe should I double the baking powder and baking soda also? wow chitra.. that sounds so perfect.. thank you so much for taking the time out to try this and sharing your wonderful feedback with us.. If you choose to double the recipe then you have to definitely double all the ingredients including baking powder and soda..
How many dates did you add?? Also since you have added more liquid to the batter then it is advisable to bake the cake for a longer time than mentioned. Also, reduce the temperature if starts browning a lot at the time due to additional baking time or place a baking paper or foil on top of the cake to avoid the browning. And I hope you checked the cake with the help of a toothpick before removing it from the oven. The cake came out so sticky and no where near crumbly.Please advise where I went wrong. So sorry to learn this..
1.How many dates did you use?? And when you ground it to a paste along with milk was it thicker in consistency? 2. And how long did you bake the cake and at what temperature? Thanks for the recipe ma’am. Will surely try and let you know soon. Tried it out today.. Texture was very soft and eveyone loved it. Thanks for sharing the healthy recipe. Hi, do you need to keep the milk and dates in the fridge during soaking? Hi , what is the cup size that you have used? Hi Ranjana.. you can use any flavourless oil here. So glad to learn this that you and your family enjoyed this cake. Thank you so much for dropping your wonderful feedback with us. It really motivates me.. I baked this cake today n this recipe is soooooo perfect. Cake came out as beautiful as yours. I tried so many dates n walnut cake recipes before n they also came out perfect but they need long list of ingredients. Thank u so much for such an innovative recipe. Thank you so much for sharing your wonderful feedback with us.. I am so glad to know that this recipe worked for you and that you and your family enjoyed it so much..
Hello..i would like to try this recipe of yours today..however i have coupke of doubts..
1) 1 cup wheat flour means how much..
2) I have lg microwave..the baking temperature and time will be same As given by you? 3) can i use ghee instead of oil? How much should be the quantity in that case? How is 1 cup wheat flour. Also I am using LG microwave..baking time will still be same as given by you and any preheating needed? 1. My 1 cup of wheat flour weighs out 135 gms. You can use any standardised cups as your measurement would work out just as fine. 2. And I have never tried this cake in a microwave so won’t be able to guide you on that sorry. But if you have a convection microwave and you have baked a cake before in that then definitely you can bake this as well. And be it any recipe or any electrical equipment definitely pre-heating is needed. Thank you so much for taking the time out and trying the recipe.. However the only way through which it could have tasted bitter is too much baking soda. Did you level it off before adding; I guess baking soda is the only culprit here. Could you please check the expiration date as well please? I recommend changing your baking soda as there are no other reason why could it taste bitter. I tired this recipe and it came out well. I added a little cinnamon and nutmeg along with flour. That sounds amazing Dipti.. And loved the addition of those spices especially at this time of the year.. warm and comforting.. Unfortunately, no noopur because dates also act like a binding agent and give the batter the right consistency so unfortunately, you cannot replace it with honey here. That sounds amazing Monika.. I am so glad to learn this.. Thank you for sharing your wonderful feedback with us. so pleased that your family and friends enjoyed the cake. All the credit goes to you for making it dear..
Its an amazing recipe for someone like me, who’s looking for a substitute for sugar, all purpose flour and eggless.. This is my first cake baking experience and everyone at home loved it.. Please keep sharing such amazing heathy yummy recipes with us..
First of all a big thanks to you for taking the time out to try this recipe and more than that sharing your wonderful feedback with us. It is indeed so kind of you to pen down so much.. I am so glad to learn that you and your family enjoyed this simple yet tasty recipe. Will try to share more such recipes. As per what you have mentioned, you are following the recipe right. By soggy do you mean the cake feels wet while tasting? If yes then may be try reducing the number of dates by one or two and try to soak it for little longer. Hi Sushma, I tried the eggless dates and walnut loaf today and it was delicious. I usually prefer adding eggs as the baked goods come out tastier but this loaf was soft, moist and so tasty. I didnt have many dates so halved the recipe n yet it was so good. Someday got to make the entire loaf. I added vanilla extract for flavour and salt for taste. I did add few chocolate chips too. Overall very satisfied with the baked product. I am a home baker and love to try out new stuff as i have sweet teeth😊 I actually viewed the no knead bread as wanted to try it out but came across this loaf and went to make it today. Thanks alot for this lovely recipe! That sounds amazing. First of all thank you so much for taking the time out to try the recipe and more than that coming back to give your honest opinion. Really appreciate it. I am so pleased to learn that you loved the cake. Yes sometimes we have our own doubts on trying out eggless recipes but with the right substitutions eggless recipes also taste equally good. And about the add-ons that you mentioned I can imagine the texture that you might have got with it. So good to know that everything worked well together; this would be helpful to many others who would want to give this recipe a try with additional texture. Thank you for that. Oh and definitely give the no knead bread also a try, I am confident that you won’t be disappointed. I tried the eggless dates and walnut loaf today and it came out so delicious. I usually prefer adding eggs and it increases the taste of baked goods but today the loaf came out soft,moist and so tasty. I actually viewed your no knead bread video as I wanted to try no knead bread but seen this video and made it today. I am a home baker who loves to try new stuff as I have sweet teeth and it was recipe for apt for me as it didnt have any sugars and healthy too. Thanks alot for this lovely recipe! I followed the exact recipe and it came out really well!! 🙂 Thank you for posting the recipe. Is it adivisible to use ghee or coconut oil instead of the regular oil. Hi,can i add chocolate chips to the batter? Yes, any add-ons of your choice can be added. HI. Sushma. I tried the cake .it tasted amazing. What kind of healthy frosting can be used for this cake? Thank you so much for taking the time to try the recipe out and share your wonderful feedback with us..
Hi.. my cake didn’t turn out to be sweet.. any particular dates to be used? Can we increase the dates qty? I prefer to use Mejdool Dates.. do not increase the number of dates more than mentioned in the recipe because it makes the batter wet and dense..